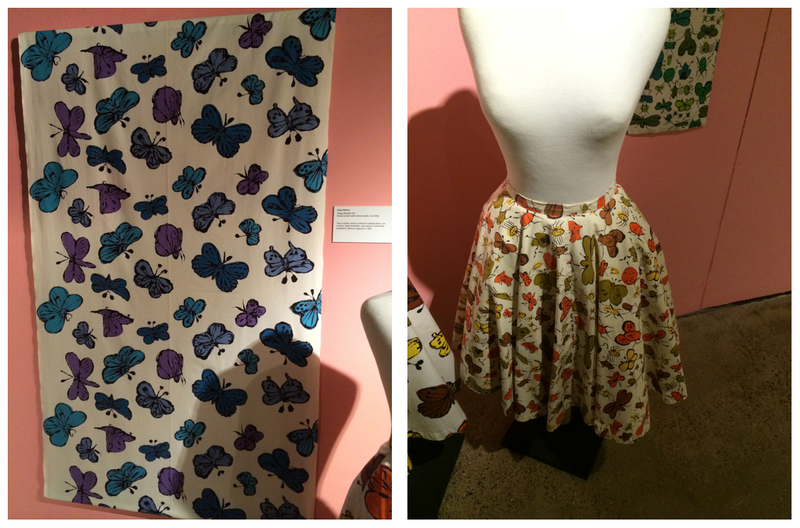 On Sunday, we popped along to the Fashion and Textiles Museum in Bermondsey. If I’m honest, it’s the one museum I hadn’t been looking forward to – but I was pleasantly surprised with what we found. 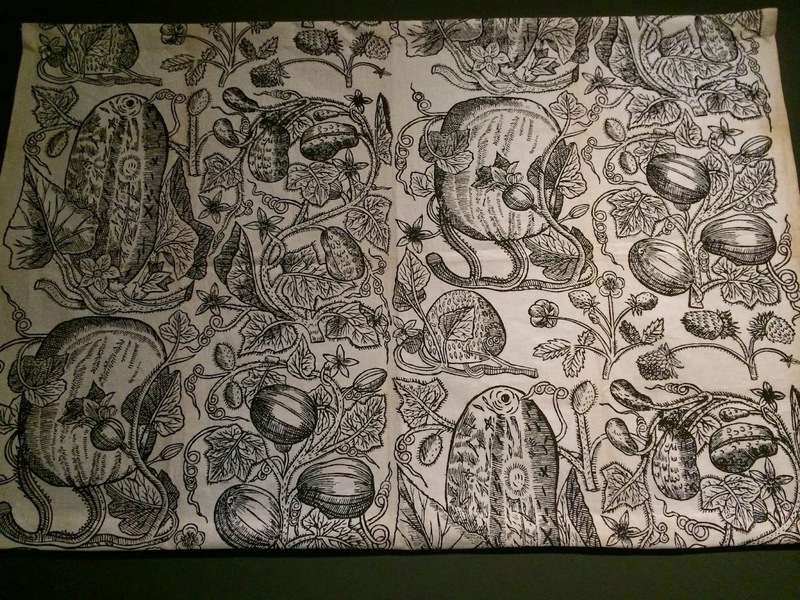 The exhibition starts by explaining that from William Morris onwards, many artists in the late nineteenth and early twentieth centuries attempted to make their work more relevant to the lives of ‘ordinary’ people. Design was recognized as a way to do this – particularly through manufactured textiles for the mass markets. I liked this textile from Ben Nicholson, Britain’s leading constructivist artist of the twentieth century. If you look closely, Nicholson worked in a portrait of his lover, sculptor Barbara Hepworth. 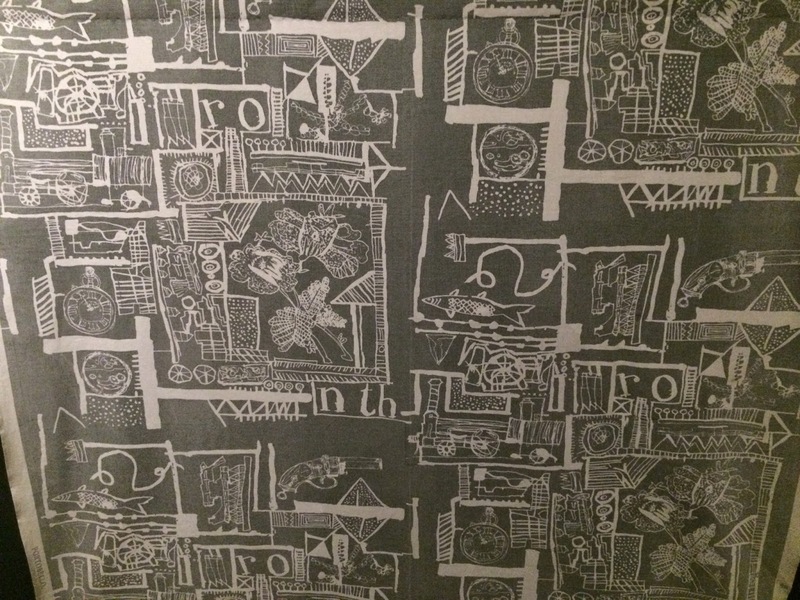 The textile below was designed by Bernard Adenay in 1911, a member of the group ‘Omega Workshops’ that worked on a group of groundbreaking murals for the Borough Polytechnic in London. 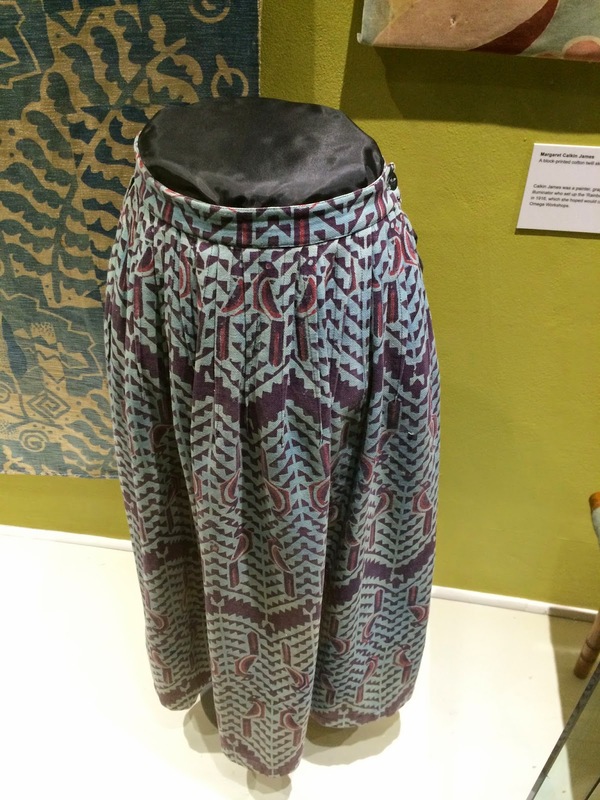 This skirt was designed by Calkin James, a painter who set up ‘The Rainbow Workshops’ in London in 1916, which she hoped would carry the ideals of the Omega Workshops. After the Second World War, there was an enthusiasm for modernity and new ways of living, and nothing showed a commitment to modernity more clearly than an association with modern art. 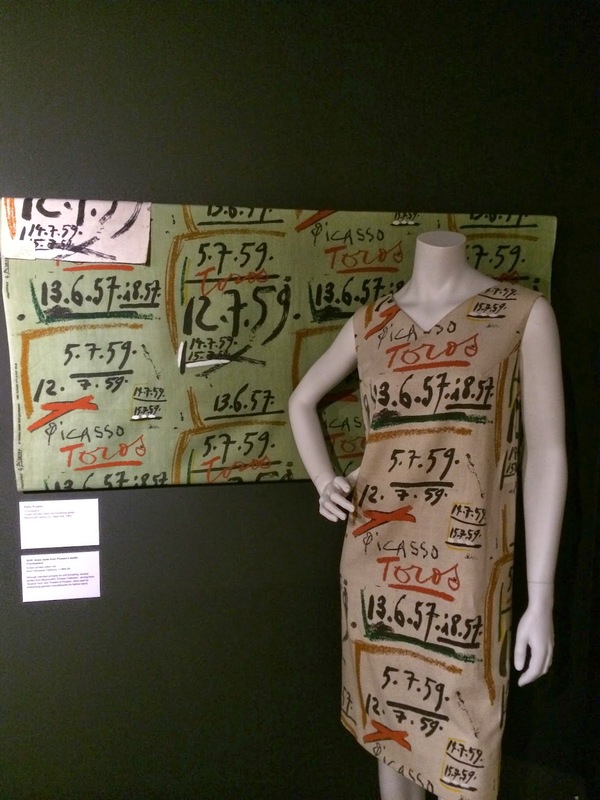 Surrealism was probably the most fashionable and popular movement at the time and NYC textile converter Wesley Simpson quickly realized the commercial advantage of associationg the work of well-known artists with his company’s textiles. Salvador Dali’s work for Wesley Simpson was there in force too. One manufacturer stuck out for me – ‘David Whitehead Ltd’. 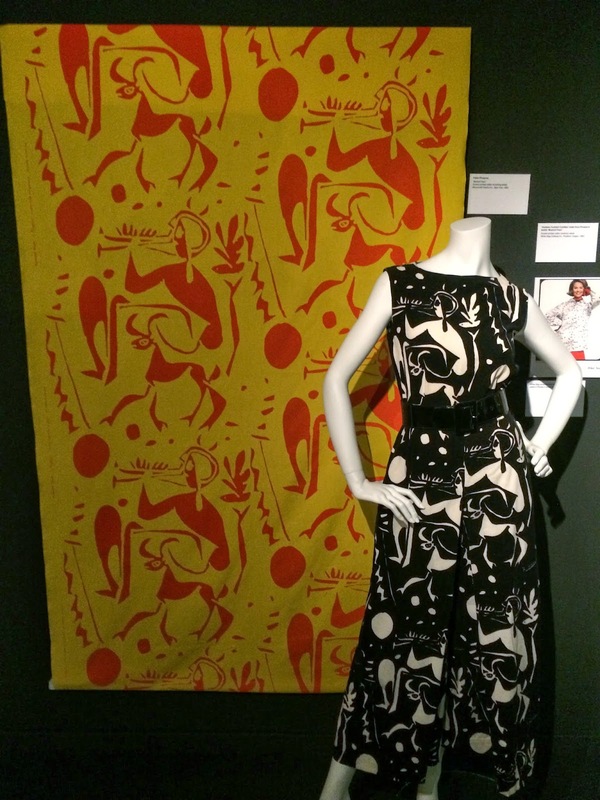 They used a populist approach to good design, offering affordable textiles from artists such as Henry Moore, Eduardo Paolozzi and John Piper. Paolozzi was a leading member of The Independent Group – he, with Nigel Henderson, created some of the most radical and influential designs of the period in Britain. 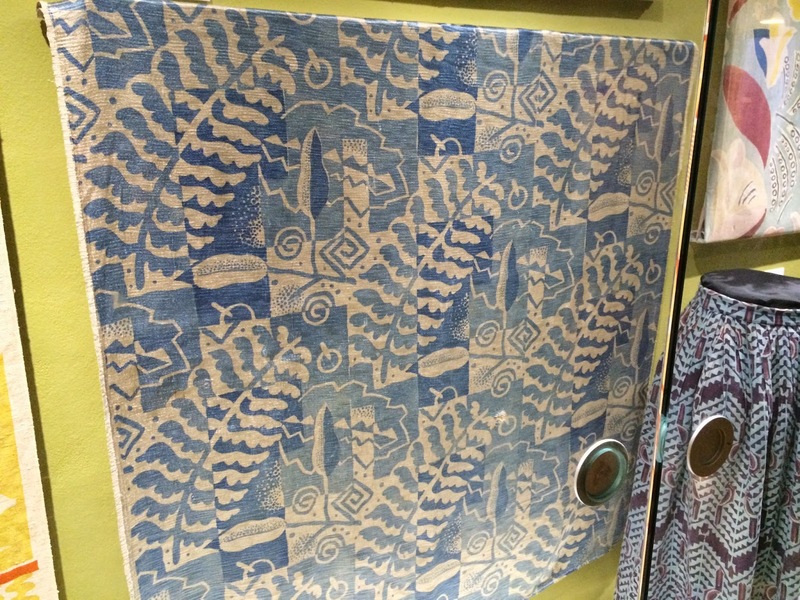 I found these patterns particularly striking. 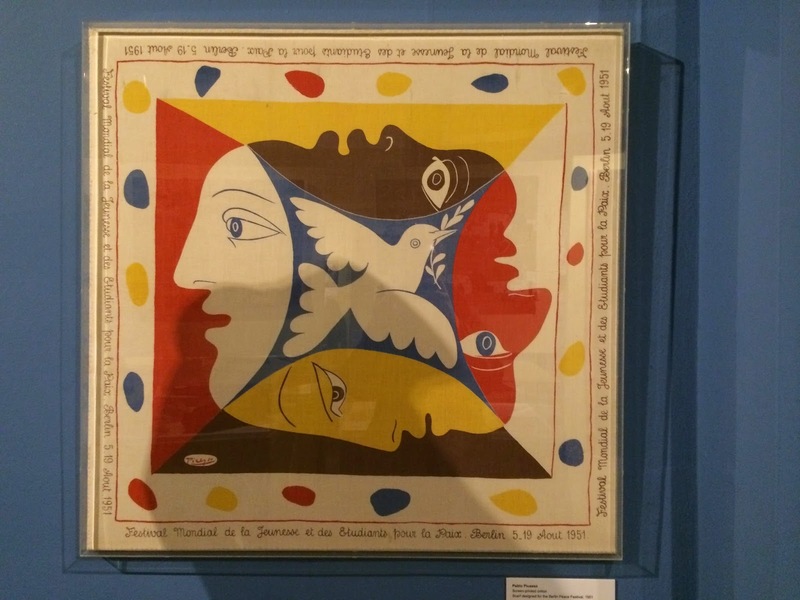 Picasso’s work in textiles was hugely impressive. This print ‘Musical Faun’ was brought to life as ‘Hostess cocktail Culottes’ by White Stag Clothing Co. This design ‘Frontispiece’ was also hugely striking. 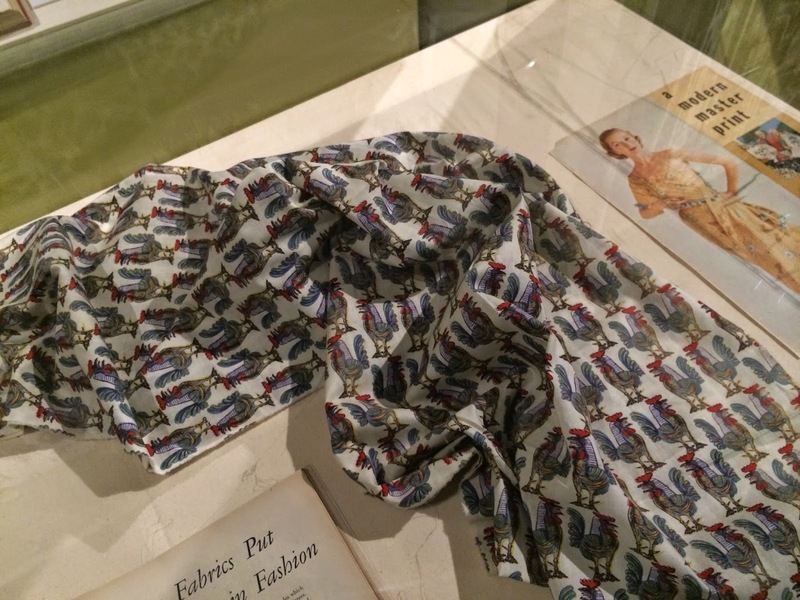 The rooster textile was exhibited too, printed on a beautiful silk scarf. 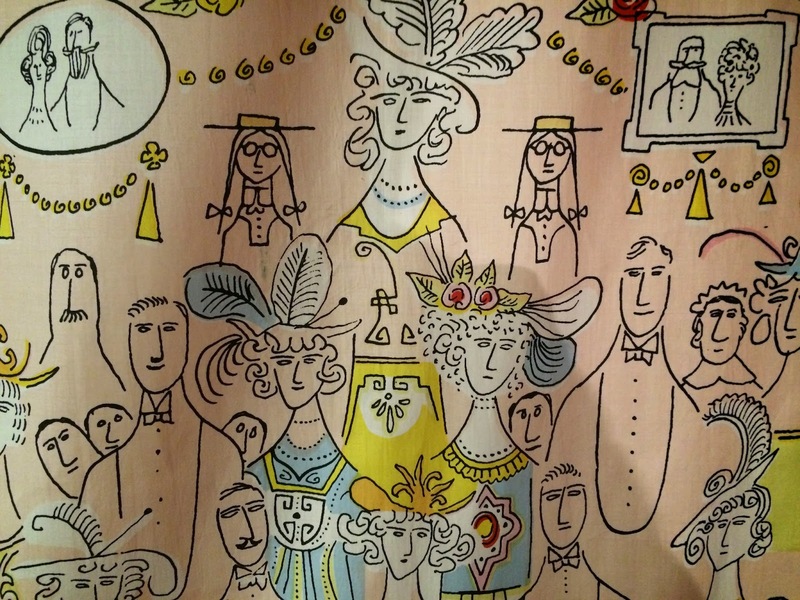 In the 1950s, a satirical illustration style emerged in New York – led by Saul Steinberg and John Rombola. 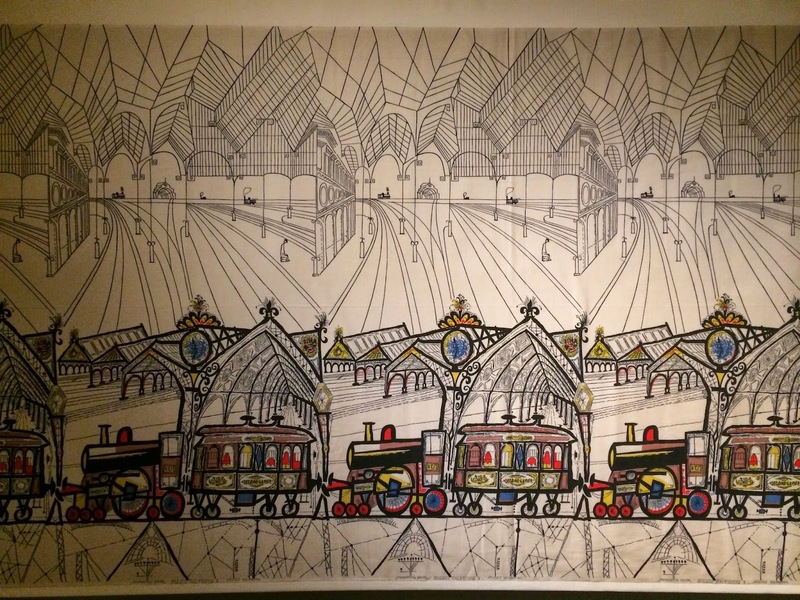 Here’s a Steinberg print, entitled Paddington Station. And here’s a Rombola piece, entitled Parade. 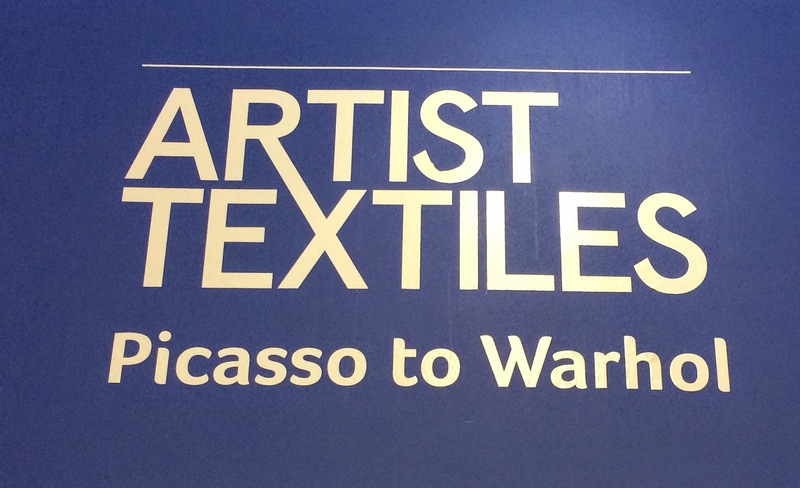 Through the 1950s, Andy Warhol – the Godfather of Pop – designed advertisements for textile companies. 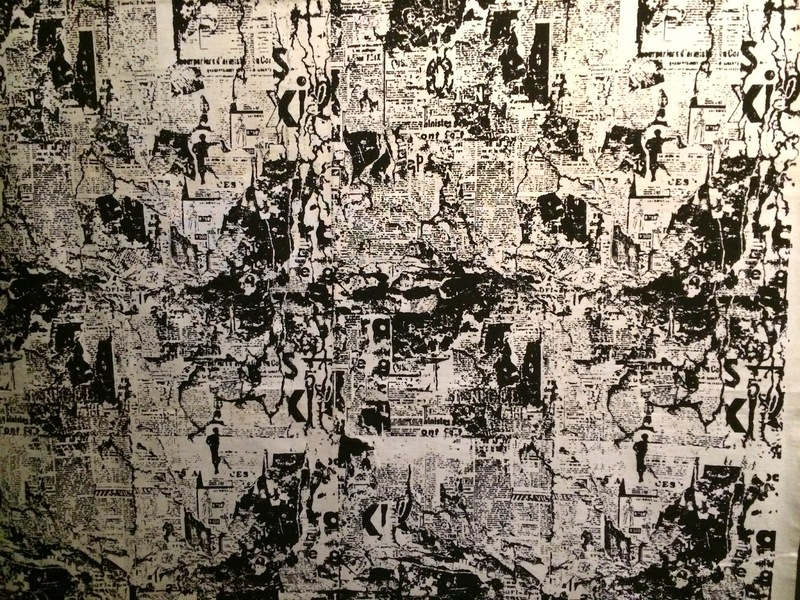 At the time, he also made several textile designs – but these have only come to light of late. I’ve missed out a load of prints – so it’s well worth going and checking it out yourself. It’s an interesting museum and I’m going to be keeping my eyes open for what they have on next. #1. 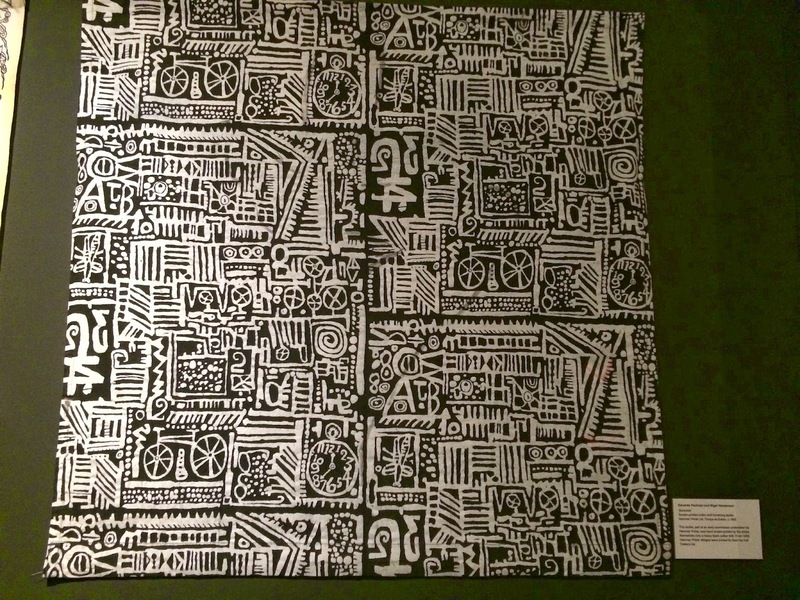 Paolozzi created his designs from an eclectic assortment of photographic material, images from popular culture, and ethnographic and scientific sources. #2. 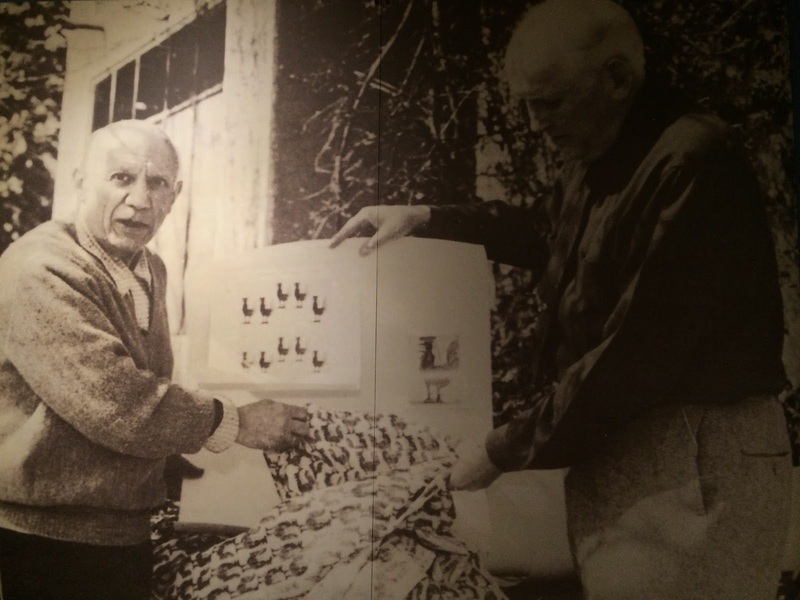 One of Picasso’s designs (featuring bulls, suns and foliage) was originally drawn by him in the visitor book of the Institute of Contemporary Arts. 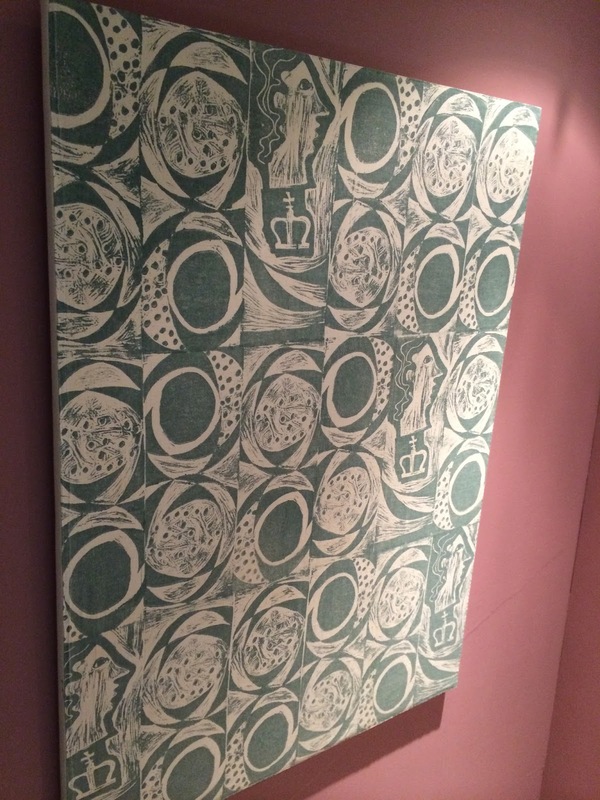 He later gave permission to the Institute to use it as a print to raise funds. #3. The Independent Group’s ideas and concepts were shown in the Whitechapel Gallery’s groundbreaking exhibition of 1956, THIS IS TOMORROW. #4. The Warhol ‘Apple’ print above was first used as the LP cover for a recording of the William Tell Overture.